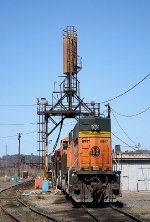 Description: I saw a couple of these that day, coal trains running with just one unit leading, and another on the rear. I'm thinking more power was added at some point farther east. Description: Eastbound DPU on coal loads thru Oreapolis NE on tne BNSF Creston Sub. Description: Power off a Coal load delivered to Minn-Dak Farmers Co-Operative. I.E. the sugar beet plant in Wahpeton ND. Description: Two faded H2 painted locos leads the GALMAD towards TRRA's Madison yard on a cloudy rainy January afternoon. Description: BNSF 8947 leads this Rush Tower UCEX coal train down the K-Line into St. Louis, Mo at mile marker 8. BNSF 8947 is about to cross Humboldt Ave. 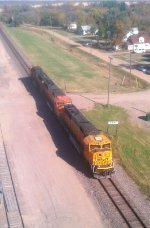 Title: BNSF 8947 lead's a Sb coal load into North Saint Louis Mo. Description: sb coal load coming into North Saint Louis Mo. Description: BNSF 8947 leads this AECX empty coal train north on the BNSF Hannibal Sub. as it heads towards Old Monroe, Mo. Currently location is near the Gibb Siding at Mp. 46. Title: BNSF 8947 Heads a empty coal up the K line near Old Monroe Mo.